Hidden inside an otherwise mediocre building in the County Louth can be found this remarkable neo-classical ceiling. 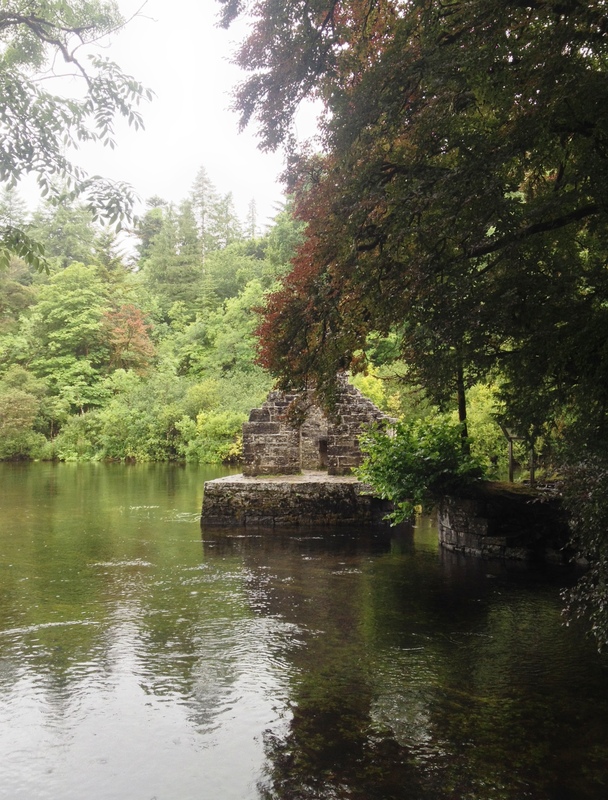 It is the surviving element of the Oriel Temple, an elaborate pavilion erected in the late 1770s by John Foster, last Speaker of the Irish House of Commons whose main residence was in nearby Collon. Within the space of a shallow eliptical vault is an extravaganza of ribbon garlands, urns, lutes and shells, all contained within a tightly disciplined arrangement. Tradition assigns the design of the building to James Wyatt and the stuccowork to Charles Thorp. Originally the walls of this chamber were decorated with a series of grisaille paintings on pagan subjects by Peter de Gree (these were later removed to Luttrellstown Castle, County Dublin. The Fosters subsequently expanded the Oriel Temple so that it became one room of a larger residence. Since 1938 the site has been occupied by Cistercian monks, this space serving as the sanctuary of their church. As some readers will be aware, over the last weekend two 18th century houses in Ireland suffered catastrophic and irreversible damage due to fire. Although in different parts of the country, what linked these two buildings was their connections to George Washington. Belcamp, on the outskirts of Dublin, dates from the mid-1780s when it was constructed by Sir Edward Newenham, a member of the Irish Parliament and ardent supporter of the American Revolution. In homage to which, he subsequently incorporated into his new residence an oval room modelled on that in the White House (itself designed by Irishman James Hoban in 1792). Furthermore in the grounds of Belcamp Newenham erected a miniature fort, the Washington Tower, built in honour and during the lifetime of the first President of the United States – and the first such monument erected to him anywhere. Vernon Mount, County Cork has been discussed in detail here before (see Mounting Concern, January 14th 2013): its name is an obvious homage to Washington’s own home in Virginia, Mount Vernon. Contemporaneous with Belcamp, the house stands to the south of Cork city on a raised site with panoramic views over the Lee valley. Highly unusual in design – being a two-storey over basement villa, the curved entrance front having symmetrical convex bows on either side – Vernon Mount was likely designed by local architect Abraham Hargrave for Atwell Hayes a prosperous merchant involved in brewing, milling and glass manufacture. A particular feature of the house were its painted interiors by Nathaniel Grogan the elder who had spent a number of years in the United States before returning to his native city. Here he was commissioned to work on the decoration of Vernon Mount, including a ceiling painting on canvas in the drawing room. Within an octagonal frame, this depicted Minerva Throwing Away the Spears of War, a reference perhaps to the cessation of hostilities at the end of the American War of Independence. Around the central work were a series of lozenge-shaped panels and roundels featuring floral motifs, angels and centaurs. Meanwhile on the first floor, reached by a splendid cantilevered stone staircase with neo-classical wrought-iron balustrade, the oval upper landing was painted with eight marblised Corinthian columns interspersed with seven doors, each having a tromp l’oeil niche ‘containing’ classical statues and urns; these doors led to the house’s bedrooms and a concealed service staircase. Both Belcamp and Vernon Mount have been allowed to stand empty for more than a decade, victims of the elements and of vandalism, since neither building was sufficiently maintained nor safeguarded. Now both are effectively ruins, with next to nothing left to salvage. In the year of a Presidential election on the other side of the Atlantic, one wonders how must our American friends view the way in which we Irish have allowed these historic links with one of their founding fathers to be squandered. The connection with George Washington ought to have been cherished and honoured, not least as a means of showing this country’s long-held belief in independence and self-government. Imagine how much the restoration of both buildings could have demonstrated the shared cultural values of our two countries: it must be asked why did not government, tourism bodies and others with a stake in promoting the state’s interests recognise so obvious an opportunity. Equally the relevant local authorities in both instances had the legal right to intervene and ensure the buildings were looked after and not allowed to fall into dereliction. Neither chose to exercise their legislative obligations and instead stood by while Belcamp and Vernon Mount slipped further and further into a pitiful condition before finally succumbing to fire. As an indictment of our state’s inability to care for its own heritage, and to recognise its own interests, the fate of these two buildings would be hard to surpass. During the reign of James I the splendidly named Sir Faithful Fortescue whose family originated in Devon came to this country where prior to his death in 1666 he bought an estate in County Louth. From him descended several branches of the Fortescues, one of which eventually acquired the titles of Viscount and Earl of Clermont. Meanwhile the parcel of land first acquired by Sir Faithful was further supplemented by various successors and came to include an estate called Stephenstown close to the village of Knockbridge. Here sometime around 1785-90, Matthew Fortescue built a new house to mark his marriage to Mary-Anne McClintock whose own Louth-based family had, through her mother (a Foster), already inter-married with the Fortescues. Stephenstown is a large, square house of two storeys over raised basement and with five bays to each side. Around 1820, the next generation of Fortescues added single-storey over basement wings to either side but that to the south was subsequently demolished. At some other date seemingly the building’s windows were given Tudor-revival hood mouldings, probably not unlike the make-over given during the same period to nearby Glyde Court (see The Scattering, April 20th 2015). However later again these openings reverted to a classical model, with classical pediments on the ground floor and entablatures on the first, the whole covered in cement render. A single storey porch on the entrance front was the only other alteration. From what remains, it would appear the interior had delicate neo-classical plasterwork, perhaps on the ceilings (none of which survive) and certainly on friezes below the cornice in diverse rooms. It is not easy to piece together the history of Stephenstown in the last century. The last direct descendant of the original builder was another Matthew Fortescue who in 1894 married a cousin, Edith Fairlie-Cuninghame. He died twenty years later without a direct heir, after which his widow married an Australian clergyman, the Rev. Henry Pyke who took on the Fortescue surname to become Pyke-Fortescue. Curiously the couple are listed as dying on the same day, 24th September 1936, upon which Stephenstown seemingly passed to another relative, Digby Hamilton. He sold up in the 1970s after which the house stood empty (and the trees in the surrounding parkland were all cut down). 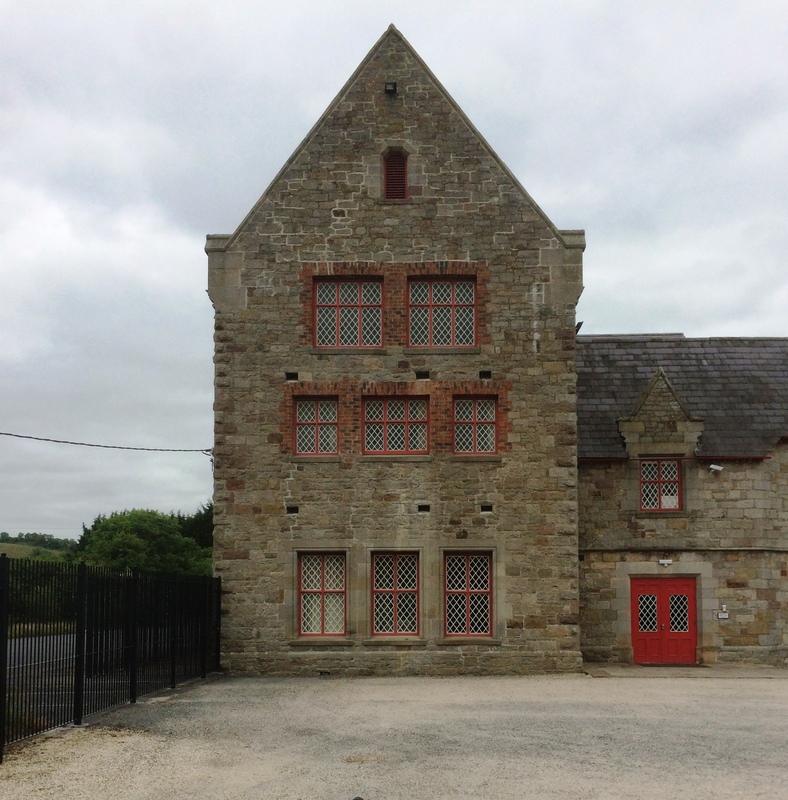 When Alistair Rowan and Christine Casey published their volume on the buildings of North Leinster in 1993, they noted that Stephenstown was ‘an elegant house, too large for modern rural life, empty in 1985, and likely to become derelict.’ That likelihood has since become a reality. Some 150 feet above the plains of County Laois rises an outcrop of limestone called the Rock of Dunamase (from the Irish Dún Másc meaning ‘fort of Másc’). On top of this are the remains of a once-substantial fortress, the origins of which have been discovered by archeological excavation to date back to the 9th century when a hill fort (or dún) was constructed on the site. This cannot have survived very long since Dunamase was attacked and pillaged by Vikings around the year 843-44. According to the Annals of the Four Masters, ‘Dun Masg was plundered by the foreigners, where Aedh, son of Dubdharchrich, Abbot of Tir-da-glas [modern Terryglass, County Tipperary] and Cluain-eidhnach, was taken prisoner; and they carried him into Munster, where he suffered martyrdom for the sake of God; and Ceithearnach, son of Cudinaisg, Prior of Cill-dara, with many others besides, was killed by them during the same plundering expedition.’ It would appear that as a result of this devastation, no further occupation of Dunamase occurred until the 12th century and the arrival of the Normans. By the second half of the 12th century, Dunamase was evidently in the possession of Diarmait Mac Murchada, King of Leinster since it was given as part of his daughter Aoife’s dowry when she married Richard de Clare (‘Strongbow’) in 1171. Thereafter the site continued to pass through the female line for several generations: Aoife and Richard de Clare having no adult sons, their lands went to an only daughter Isabel de Clare who married William Marshall. None of their five sons outliving them, the lands were divided between five daughters, one of whom – Eva Marshall – married the Welsh March lord William de Braose. Once more this couple only had daughters, the second of whom Maud married Roger Mortimer; in the mid-1320s their grandson, another Roger, the first Earl of March, became the lover of Queen Isabella (the She-Wolf of France) and led the revolt against her husband Edward II. When the king’s son, Edward III, had Mortimer executed for treason in 1330, the family lost their Irish property and although it was later restored to them, by that stage Dunamase seems to have come under the control of the local O’Mores. In any case, by the middle of the 14th century it had begun to fall into a state of disrepair and although there are stories that Dunamase was destroyed by Cromwellian troops (as there are about almost every other dilapidated fortress in Ireland), it seems that by the time the latter came to Ireland in the mid-17th century the site had long since become uninhabitable. Some restoration work was undertaken towards the close of the 18th century by Sir John Parnell, Chancellor of the Irish Exchequer and Lord of the Treasury (also great-grandfather of Charles Stewart Parnell): he incorporated stone door and window cases from other local antiquarian sites into the upper portion of the old castle with the intention of creating a banqueting hall but the work remained incomplete and was abandoned after his death in 1801. After more than six centuries of neglect in an exposed position, it is understandable not a lot of the Rock of Dunamase’s Norman castle survives. Sometimes utilising the natural rock formation for defensive purposes, a series of walls had been constructed, the interior portion of the site accessed by an outer and inner barbican, the second of these incorporating a ditch and a drawbridge. The upper part of the rock was further protected by a curtain wall with its own gatehouse, and at the very top was a large hall or keep. This part of the structure was most modified by Sir John Parnell but it is likely he also undertook remedial work elsewhere on the rock and thereby secured what has survived to the present day since otherwise even more might have been lost. Now a visitor to Dunamase needs to bring along imagination in order to conceive how the place once looked. On the other hand, the views from the top remain superlative, stretching in every direction for many miles and only occasionally spoilt by injudicious development (made even more apparent from such high ground). It is easy to understand why the Rock of Dunamase was chosen as a place of defence but also, given the site’s relative inaccessibility, why it was subsequently abandoned.